From downloading over installing to using the software this comprehensive tutorial covers the aspects of adjusting, cropping and resizing your own photos for web design or other uses. 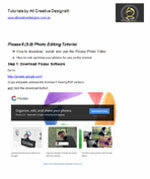 Picasa is free photo editing software from Google and very capable to compress your images for web use. Photos you modified and saved can be used in our web design tutorials. Follow this easy step by step tutorial featuring full color screen shots and learn to web optimize your photos for the world wide web. Duration of this tutorial is approximately 30 - 40 minutes and will enable you to adjust and optimize your photos for web page design and other uses. Learn how to use the new Google Creative Kit online photo editor now included in Picasa 5. Select an image with a large file size, in this example we are using a 2.5 MB JPG at 2816x2112 px from a 5 MPX digital camera. Why not use HTML resizing to insert the photo into the web page. Because HTML resizing does not compress the image file size, so inserting a 2.5 MB file into the web page will result in very slow download speeds on the internet. The goal is to create a reasonable quality image with a small file size. Only JPG, GIF and PGN file formats work on web pages.